An exciting family estate, headed up by the irrepressible Bruna, & her husband Franco (Fiorino of Ricca), whose 14ha of vineyards cover four villages (communes) of Grinzane Cavour, Roddi, La Morra & Serralunga d’Alba. Bruna’s father Giovanni (nato ’33) had sold wine in bulk, in demi-john or occasionally in bottle when the year was propitious. Export markets didn’t exist & they mostly produced Dolcetto, the local favourite! From 1989, with the arrival of Bruna & Franco in the cantina they started bottling every year. They started bottling commercially under the ‘Bruna Grimaldi’ label in 1999. It was Bruna who began exporting their wines. In 2015 their son Simone graduated from the Alba wine school, Umberto 1, having started working in the cantina from 2013. 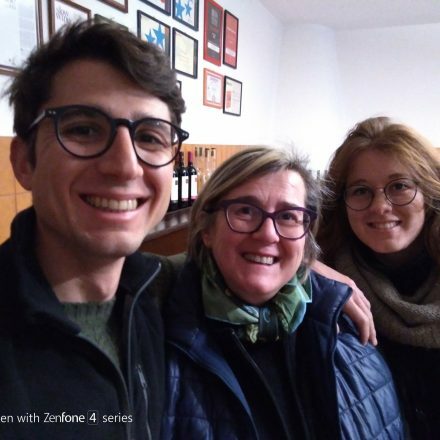 Their daughter Martina worked as a Wine Buyer in London, but since December 2018 has returned to Grinzane to help the family entreprise! In those early days they flirted with tonneaux, plus a couple of botti grandi (from 2000), but a new bottaio in 2014 has given them more space to invest in five more botti grandi of 16HL, 21HL & 30HL, along with more 500/700litre tonneaux; indeed two 50HL troncoconico wooden vats are in-bound! They vinify their wines in a mix of stainless-steel & cement vats. Malolactic generally takes place in cement, soon after the alcoholic ferment, to ensure the wine is clean going into wood. In 2008 they first started employing the ‘cappello sommerso’/submerged cap method of extending the maceration, staked down in the s/s vats (to achieve a rounder tannin profile). Grinzane Cavour is where the winery is located, & birthplace of Bruna’s father Giovanni, hence their plots in the crus of Borzone (1ha planted in 2012 & 2007 at 220m asl) & Raviole (0.84ha at 280m asl planted in 2000). Serralunga d’Alba is home to Bruna’s mother Clara (Scarzello) – a.k.a ‘La Badarina’! It’s her family that own a prize, 2ha piece, ave. 20 yo vines of the Badarina vineyard, 400m asl high up, lying just across the road from Boscareto & Francia. Their best-exposed plot & monopole, Vigna Regnola becomes the Badarina Riserva. In the commune of Roddi, they have two fine plots in the heart of the Bricco Ambrogio vineyard (0.7ha & 0.2ha aged between 10-25yo), that Bruna & her husband bought together in 2006; first vintage 2007. 2007 is also the year when the family stopped using herbicides in their vineyards. They also have 2.5ha of south-facing vines at 240m asl in La Morra’s Roere di Santa Maria vineyard (10 yo & 40 yo vines, the Roere planted in 1972); yet a glance & whiff tells you this vineyard belongs in Verduno – indeed it lies on the confine/border, not far from the Roero! This last vineyard makes up 50% of the Barolo ‘Camilla’; the remaining 50% coming from Grinzane Cavour. Finally they have vineyards in the comune of Diano d’Alba & (salty) Sinio (Vigna del Gallo), that make up approx. 60% of their Nebbiolo d’Alba; the remainder being from Roddi. Since vintage 2014 they have been farming organically. 2017 Nebbiolo d’Alba – tasted Nov’18 from tank, to be bottled March’19, a blend of fruit from Roddi, Roddino & Diano: che finezza! Lots of pretty, wild strawberry, almost mentholated, dare I say ‘ribena’ esque?! Lovely cassis, charming & ready to go! 2015 Barolo ‘Camilla’– tasted Oct & Nov’18, bottled July’18, a blend of fruit from Grinzane Cavour, La Morra/Verduno…& perhaps a dash of Badarina, I gather (!? ), 90% aged in botti grande: earthy, ripe strawberry, open, floral, such gioia, rose fragrance (vigna Roere), white spice, open book, refined, sensual tilth. From vintage 2017, the Barolo ‘Camilla’ will include fruit from Verduno’s San Lorenzo vineyard! 2014 Barolo ‘Camilla’- 14%, tasted from bottle, 3 Nov’17; a blend of fruit, two-thirds from darker Grinzane Cavour vyds of Borzone & Raviole (on Diano soils), & a third from La Morra’s Roere di Santa Maria on the border with Verduno (from 2011), i.e. white talcum powder soils. Cement & stainless-steel, followed by two years in 50% botti grandi, 50% tonneaux, bottled a year before release. Bright, clear, pretty cassis red, a classic Barolo colour! Delicate perfume of rose petal spice, a hint of neo botte grande, of leaf litter, clove & curry even; to taste, bello pieno, volume, refreshing, alive, a real sense of that Roere (Verduno!) vineyard coming through with soft, orange peel tannins, rose petal fragrance, cool restraint, a core of sweet red fruit, juicy, but also salivatingly sapid. Classic but giving. 2015 Barolo Bricco Ambrogio, Roddi – tasted Oct & Nov’18, bottled July’18, fine, open, broad, juicy, incense & orange peel appeal. Lots of stoffa/material, volume of mandarin like fruit, relaxed, refreshingly mineral too. 2015 Barolo Badarina, Serralunga d’Alba – tasted Oct/Nov’18, bottled July’18, macerated for 30 days on the skins: tight, fresh, spezia, ethereal fieno/hay, dried grass, whiff of morning cologne, very expressive, sinewy, salty, taut coil, exciting, lots of light/luce! 2013 Barolo Badarina, Serralunga d’Alba – tasted May’18 at the cantina (having been open 24 hrs! ), 14.5%, aged in two 21 HL botti + some tonneaux; sure-footed presence, pretty sweet fragola e cassis mixed with sandalo spice, suave soffice, dolceastro, red cherry stone finish. Impressive. 2012 Barolo Riserva Badarina, Serralunga d’Alba – tasted March’18, 14.5%, having spent 36 mths in wood; sempre from the south-facing, Vigna Regnola plot of Badarina. Compared to the 2011, the 2012 is fresher, more complete, still luxuriant, with a rich, heady, balsam oil, orange peel, leather, aniseed, tea leaves & quinine perfume; to taste, it’s full, refreshing, alive, wearing its 14.5% + lightly, indulgent sii!, but balanced by lots of pace & dynamism too. Succulent, irresistible even now! 2011 Barolo Riserva Badarina, Serralunga d’Alba – tasted from bottle, 3 Nov’17; formerly labeled as ‘Vigna Regnola’ (meaning a cantankerous person!) until 2001, from the finest exposed parcel in the heart of their 2ha of Badarina, aged for 30 mths prior to release. The current 2011 vintage is unsurprisingly rich & decadent, superripe, leather, tobacco, with gelato, strawberry ripple, & curry plant notes; rich on the palate, seamless tannins, creamy red fruit – hedonism, puro! 2010 Barolo Riserva Badarina, Serralunga d’Alba – tasted May’18 at the cantina; piu intense/scuro than vintage 2011, with more profondita, layers, notable presenza of tamarindo, of teak furniture; richly compact with kirsch fruit, great energy, electric even, plenty of blackstrap licorice, reminds me of 2014! Molto buono. 2001 Barolo Badarina ‘Vigna Regnola’ (Riserva), Serralunga d’Alba – wow! What a difference four vintages can make! Completely unrecognisable from the torrid 2005, but then 2001 is more highly regarded & classier, as a rule. Indeed it’s more limpido/clearer, i.e. stable! Pale 2001 red, fresh, ethereal, leather, sapid; the palate’s beautiful, refined, kirsch red cherry stone, ginger root, salato, peaceful, it flows…! 1999 Barolo Badarina ‘Vigna Regnola’ (Riserva), Serralunga d’Alba – another classic example of this prodigious vintage: fine on the nose, it’s got presence, leather, orange skin, stoffa/substance, not as fine on the finish, but impressive nonetheless.